At CarMark Hawaii, as Honolulu used car buyers, we know what it takes to properly maintain an older model car. Many people prefer to keep an older vehicle as long as it’s in good condition and gets them from one place to another, easy to understand considering the high price of a new car these days. That said, when maintenance and repair costs reach the point that you could be making payments on a new car, it may be better to just trade your used vehicle in on a new one. Sometimes maintaining an older car – or an old “beater” – is more costly than just buying new. However, if your older model is performing well and you’re happy with it, there are some things you can do to keep it running great and looking good. Who knows, you could be one of those people who has a 20-year-old car with 250,000 miles that runs like a top for many years to come! Here are a few tips. Check the oil and have it changed regularly (or change it yourself). 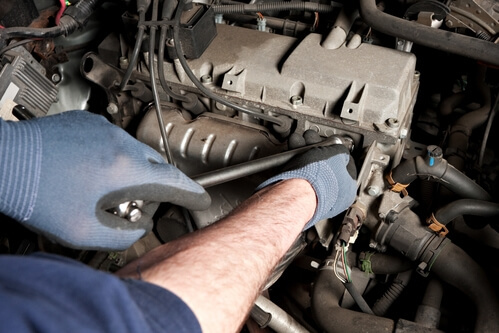 Most experts recommend having the oil and filters changed about every 3,000 miles. This is the single most important thing you can do to help ensure the engine lasts! Prevent corrosion in the cooling system and build-up of deposits by flushing the cooling system each year. A mixture of half coolant and half distilled water will ensure it remains in good shape. If you live in a colder climate, be sure to spray off the underneath of your vehicle to remove road grime and salt. Differential oils, transmission fluid, and gear oils should be changed out occasionally, according to service intervals. Apply a coat of quality wax every six months to keep the exterior of your car looking good, and to protect paint. Lubrication of u-joints and other driveline components is important for a long car life, as is having all of the moving parts greased. Your auto care professional can take care of this for you. Brake fluid attracts moisture, which can result in failure or corrosion of components. Have the brake system bled and replace brake fluid once each year. This is a low cost maintenance item that can prevent you having to spend a good chunk of money on new sensors, hoses, and calipers! Apply a UV protectant product to keep the plastic and vinyl components (such as the dash) inside your car from drying out or cracking. You may also want to consider a window deflector screen if you don’t have a place to park in the shade. As you can see, keeping your older vehicle in great shape requires more than an oil change every so often. Take care of your car and it will take care of you for many years to come, delivering you to your destination safely. Looking to sell your used car for cash in Honolulu? If you have decided it’s time to move on to something newer or you could simply use the cash for the holidays, come see us at CarMark Hawaii where you get a fair deal, and friendly professionals are always available to help.